After teasing the phone for a long time, Samsung has finally launched its first budget device under its M series “Galaxy M10” in India on January 28. 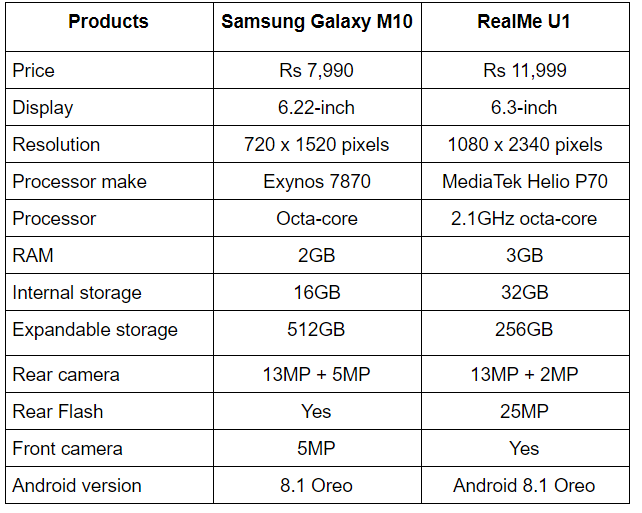 We are comparing the device with the RealMe U1, which was considered a pretty decent device under Rs 10,000 last year. 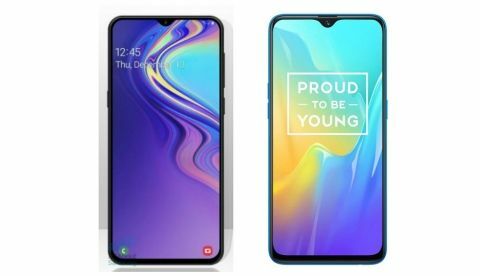 The Samsung Galaxy M10 has been finally launched in India alongside the Galaxy M20 at a starting price of Rs 7,999. The phone has a dual camera setup on the back and a water-drop notch on the front. The smartphone is launched in two variants 2GB/16GB and 3GB/32GB storage models. On the other side, we have the RealMe selfie centric device “U1” that has a 25MP AI-powered sensor on the front along with a dual camera setup on the back. It is also the world’s first smartphone that features a MediaTek Helio P70 chipset. So, if you’re thinking of purchasing a new smartphone under a limited budget and if these two are in your mind then here’s take a look at the specifications comparison of the two to know which device would be the right one to buy as per your requirements. As you can see in the specs sheet above, the Galaxy M10 sports a 6.22-inch display that offers a resolution of 720 x 1520 pixels. On the other hand, the RealMe U1 also features a 6.22-inch display. However, it offers a resolution of 1080 x 2340 pixels. When it comes to the processor, the Galaxy M10 is powered by an Exynos 7870 octa-core processor, which is paired with 2GB RAM and 16GB internal memory that is expandable to up to 512GB. On the other hand, the RealMe U1 is the world’s first device, which is powered by a MediaTek Helio P70 chipset, which is clocked at 2.1GHz. The phone packs 3GB RAM and 32GB internal memory. As far as the cameras are concerned, the Samsung Galaxy M10 has a dual rear camera on the back along with a 5MP sensor on the front. On the other hand, the RealMe U1 has a 25MP AI-powered selfie camera with a dual 13MP + 2MP rear cameras. The Galaxy M10 will go on sale in India on February 5th via Amazon, while the RealMe U1 3GB/32GB variant is available on Amazon for Rs 11,999.